What better combination than water slides on a hot summer’s day? Slipping down the slide with water splashing and cooling you down! 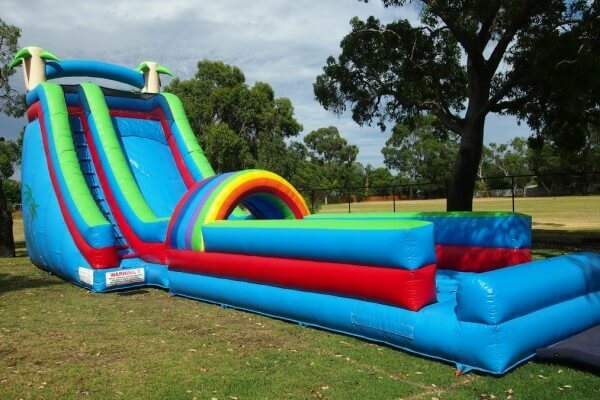 Well, actually inflatable water slide hire on any day of the year would be a terrific combination, as most of our water slides can be used with or without water. Water slides provide hours of endless fun for a range of kids ages and adults, making them perfect for any event. 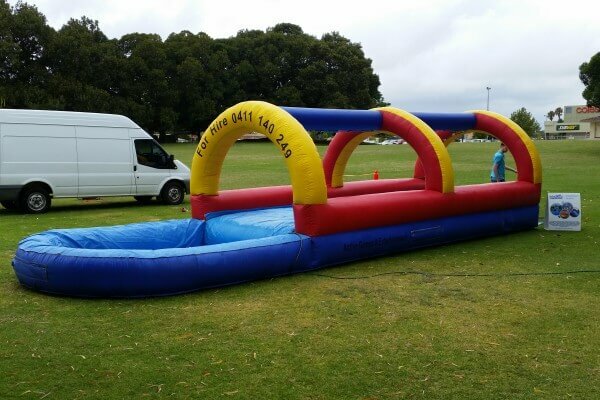 If you’re looking to hire inflatable water slides for your next event, then contact Active Games and Entertainment to help you organise options to suit your event. Using our personalised approach, we listen to you, and provide advice and suitable options to ensure your needs are met. We can customise the finest details dependant on exactly what you want to achieve, the level of entertainment you require and your budget. 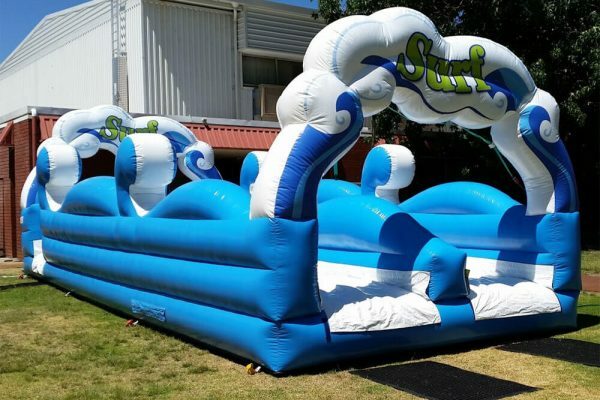 Our inflatable water slides are the latest on the market adhering to Australian safety standards and we have one of the biggest range of inflatable water slides for hire in Perth. Whether you’re after something simple, like a Slip n Slide or something larger, like the Two Lane Mega Slide, a collection of our biggest slides, we’ll have something that will float your boat. For us, no job is too big or too small. We pride ourselves in customer service and safety is always our top priority. Single Lane Super Slide – This is one of our longest water slides at 20 metres long. With this length you can really get some speed, providing hours of fun for both kids and adults. Dimensions of the slide: 20 meters in length, 6 metres in height and 6 metres in width. 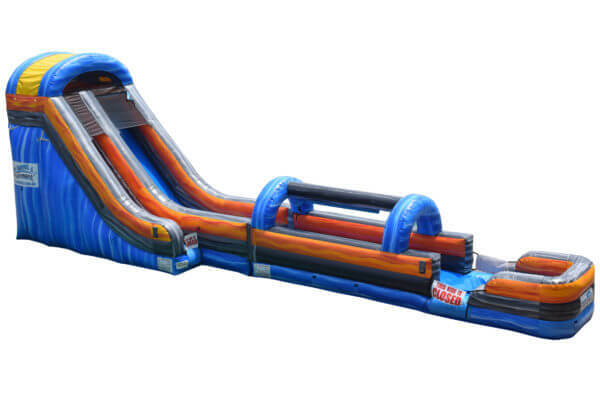 2 Lane Mega Slide – As the king of water slides, this water slide makes for an amazing event. 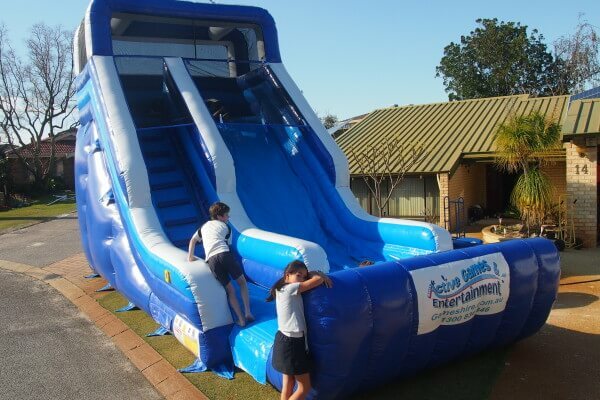 At 28 metres in length, 7 metres wide and 8 metres high, this slide is sure to impress. Great for events and parties where attendance is high, such as schools, community events and sporting events. This will keep the guests entertained for hours. Bubble Wash – If you are lacking a bit of space and require an inflatable to entertain younger children, this inflatable would be suitable for you. 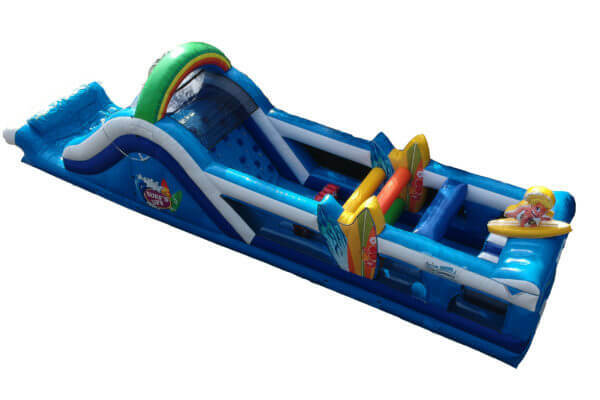 At 12 metres in length, 4 metres in height and 6 metres in width, it packs just as much fun as the others. This inflatable water playground is designed to look like a car wash. It’s great for smaller children that may not be able to use some of the bigger water slides. 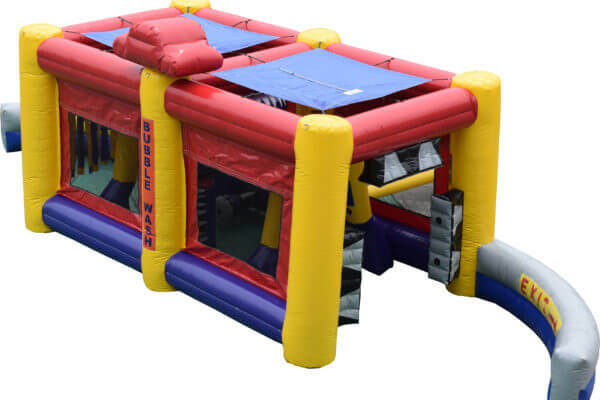 The kids and/or adults can run through the inflatable house and are sprayed by water and air jets. Perfect hire for playgroups, or at an event which caters for younger children. 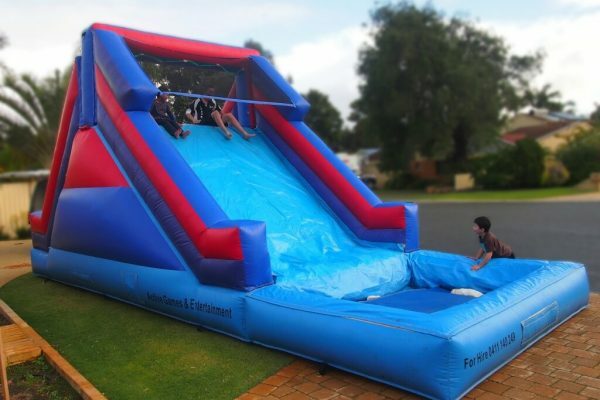 Blue Wave Water Slide – As a medium size water slide, this one will fit in most backyards, making it suitable for smaller events such as a birthday party. 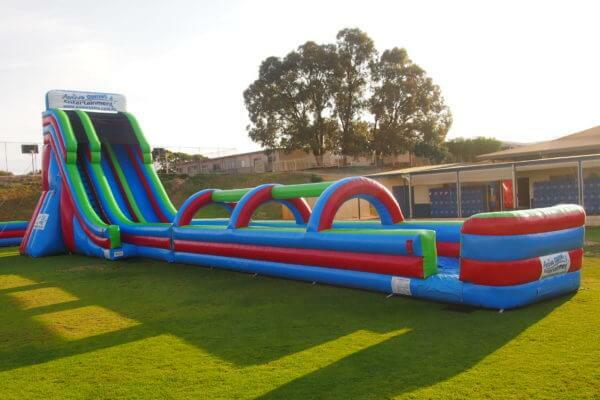 This slide is 10 metres in length, 4 metres in width and 5 metres in height. This slide can also be used wet or dry, making it perfect all year round, from the hot summer months to the cooler winter days. Alternatively, we offer combination packages that include multiple different products, in fact, we can organise specific packages to meet your personal event needs and take pride in making our customers happy with our tailored service. Wanting more information or have a question? Give us a call on 0411 140 249 or 1300 834 346. Alternatively send us a message over on our contact page or email us at info@gameshire.com.au.